for a truly enchanted celebration with family, friends or colleagues. 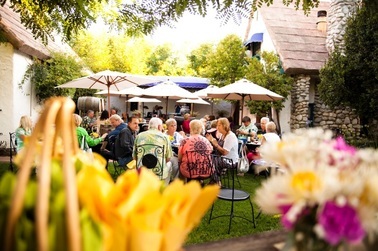 A private event at Briar Rose Winery will be long remembered. In the heart of Temecula's Wine country, Briar Rose Winery is an enchanting event destination that is ideal for gatherings of a maximum of 30 guests. Our event specialist will help you select the ideal setting, meal and activities for an Enchanted Wine Country event. Tasting room is available to be reserved for small group private wine tastings. Our enchanted hilltop property is even more stunning after-hours. Watch the sun set in the Cottage Garden or Patio that offers spectacular views of the Temecula Valley, as you and your guests enjoy an elegant dinner. Coming Soon - If you would like to make an appointment to visit Briar Rose Winery to view the property or discuss the details of your event, contact us at 951.308.1098.